Our themes for Osclass all share the same theme settings which are provided by shared theme extension that is called Madhouse ThemeKitchen. Settings are divided into multiple sections. Pretty straightforward general – site related – settings such as your logo and its variant, favicon, etc. Tips! Note that you can upload different images per language and that if a language is empty, it will default to the first language with a logo or favicon. This section is dedicated to customization options to defined how your classifieds website will behave and enable or disable some features. Tips! 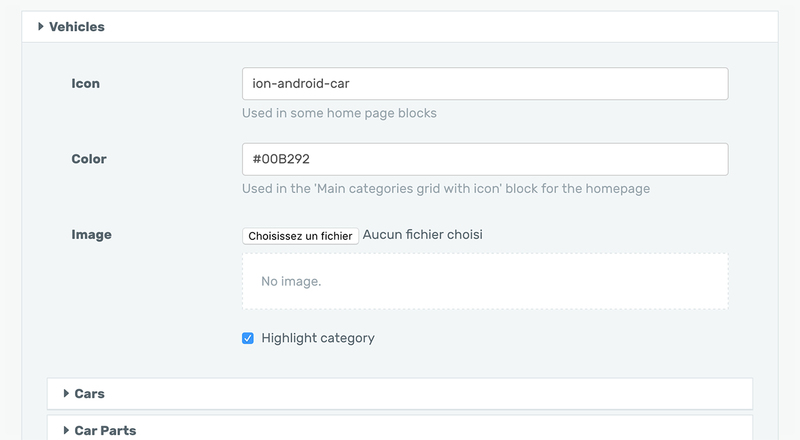 As for previous section, some options like the search form placeholder are available in different languages and will fallback to the first non-empty language if not filled. Widgets are a very important part of our theme magic! There’s three kind of widgets: standard, feature and flashmessage. Standard widgets are parts or blocks of your page that you can add, remove or reorder as you wish using a nice drag-and-drop UX. A widget consists in a content and when search related a set of rules: (1) a predefined blocks or (2) a static page or (3) some custom HTML code that you enter that will be displayed on a widget hooks. (1) Please, refer to the documentation of your theme to get the complete list of pre-defined blocks. (2) If you choose a static page, it’s title and content will be displayed on the page you have added the hook to. There’s additionnal filters for widgets that will display on search pages to define rules base on current category or current location (city, region or country). Current category: give a list of category ids to only show the flashmessage on particular categories; eg. “1,2,3” will only show the message when search categories are 1 or 2 or 3. Current location: give a list of location, eg. “Paris, California, Sri-Lanka” to only show the flashmessage when search location are Paris or California or Sri-Lanka. Flashmessages are text banners that will display most likely at the top of your website pages. Use them to draw attention of your users to discounts, important news, or your next event. Supported values for the “Custom class” field are: default, primary, info, success, warning, danger like the Twitter Bootstrap 3 alert components. Tips! You can find the same search filters as for standard search filters that will only apply when “Show on…” for search is checked. Features are special widgets that sits on your homepage and explains what your website is about, what makes it special, why your users should continue to browse, etc. That’s your marketing speech in two or three bullet points. This section lets you configure the included homepage slider. This section lets you customize the look-and-feel of the theme by choosing the color variant or apply some custom CSS code. Some themes can offer more design options than others. The custom CSS will be enqueued AFTER any other theme CSS code. You can customize further your categories by choosing an icon, a featured image, a color. Those settings will be used by widgets, especially by following pre-configured blocks: homepage_categories_grid and homepage_categories_icon. The backup section will generate a SQL export of your current theme settings including layout options, widgets, categories, etc. You can then import it into another Osclass installation through an SQL manager tool like phpmyadmin or adminer. Important! Settings for images are correctly included in the export but you will have to copy your image files manually.